this spring, i've been working hard on a creative (?) 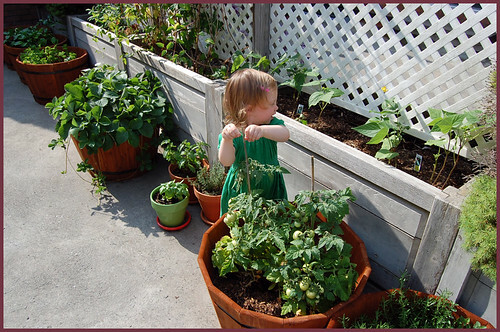 hobby that i never thought i could even do, or would even like: vegetable gardening!! 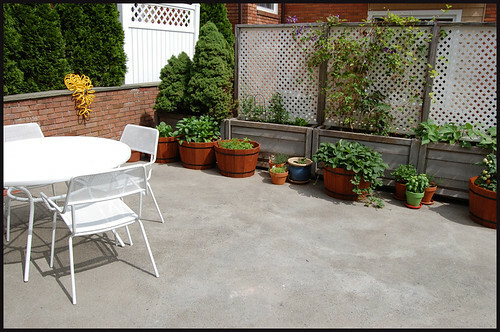 our townhouse here in connecticut has a fairly large patio/garden space, as seen in the two photos below, which show the left and right sides of the patio, respectively. 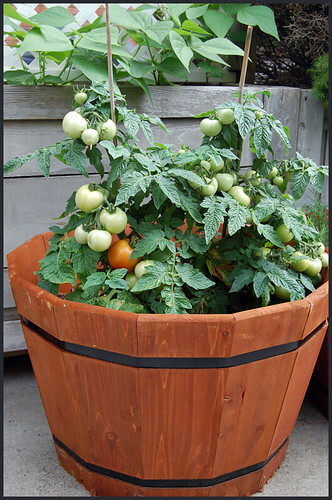 the patio came good to go with some wood-framed, weathered containers that support three trellises. 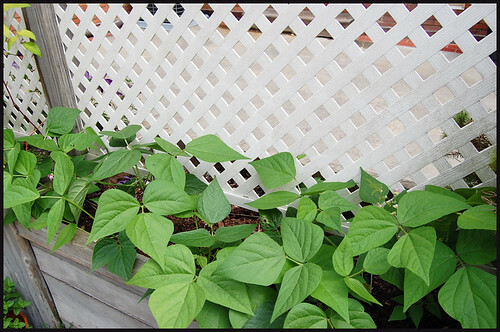 the foliage in these containers and on the trellises basically separate our space from that of our neighbors. 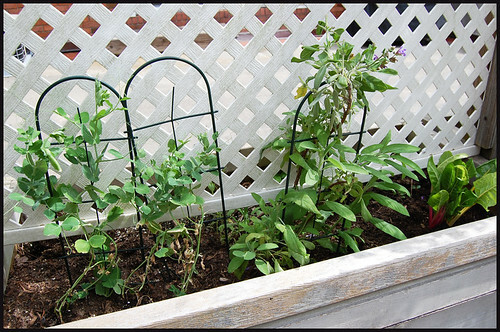 all three trellises used to have clematis vines covering them, but at the end of winter, when we first moved in, some of them were looking kinda nasty and overgrown, so we hacked two of the vines down, leaving only the vines in the center. 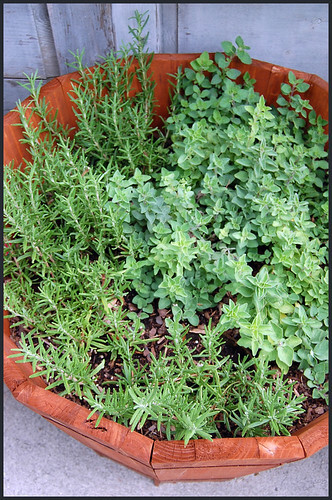 a previous tenant had planted lemon balm, rosemary, and sage in those containers as well. we left the sage in place, but took out the lemon balm and rosemary, so we could make room for more and/or different plants instead. 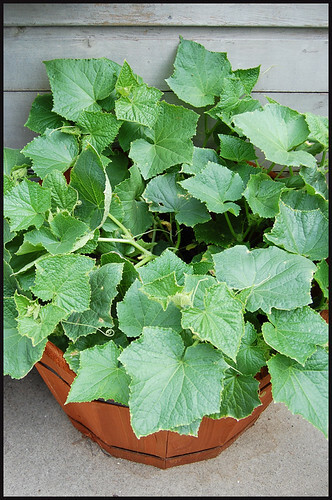 plants: all my plants are transplants; alas, nothing in the garden from seed this year. i started kind of late with the garden, and have been adding plants to it organically, so to speak, since roughly the end of march. i put in the strawberries and herbs first, then a lettuce, green beans, peppers and tomatoes, then several heads of different kinds of lettuce, a few peas, chard and cukes, and finally, a few random herbs and that rainbow chard, added in yesterday. i would really love to start some of my plants from seed indoors next year, when i'll have more time to prepare and experiment. 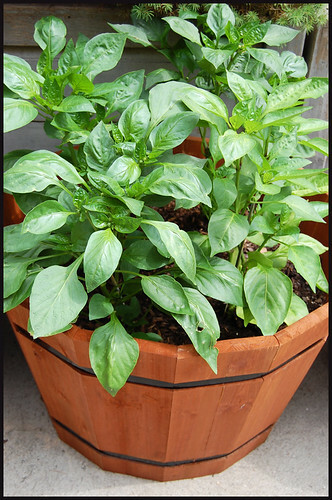 to help me figure everything out, i got a great book called bountiful container, by mc gee and stuckey, which has basic info on most garden veggies, herbs, fruits, and edible flowers, and how to grow them effectively/successfully in containers. it's not the be-all, end-all gardening resource but it's been good enough for me, thus far. 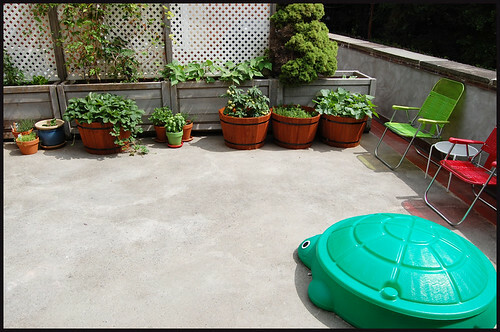 to make the garden useful for hanging out/funtimes/eating/etc., we also added an awesome white metal patio set, from CB2, some colorful beach chairs from target, a small white metal table from ikea, and a turtle sandbox for baby-girl. it's a work in progress. i think i eventually want to get an umbrella for over the table, maybe this orange one (also) from CB2, so we don't sizzle in the thick of summer. speaking of baby-girl, poppy LOVES hanging out in the garden! she loves to help dig in the dirt, touch/explore all the plants, and most especially, she LOVES watering the plants (and getting wet!)! she begs me to turn on the hose, asking if we can "WAH-DEEE!!!" every time we go out there. the sweet peppers seem to be doing fairly well; there are no actual peppers yet, just some blossoms starting. they'll be green and yellow varieties when they do bust out. when i bought them, they already had adorable baby peppers on them, but i read (in the mc gee and stuckey book) that that is bad and keeps them from being as prolific as they could be, so following their suggestion, i pinched off the original peppers and blossoms and now all the pepper plants are growing like mad and it looks like i am gonna have a huge harvest, if everything goes well. it will be interesting to see how many actually grow! 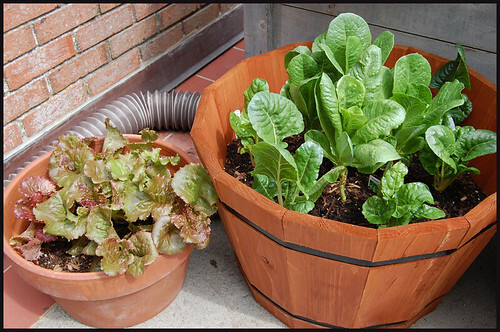 i added the romaine and deer tongue lettuces about halfway through the spring. they are doing very well, i think. there's a ring of chard around the outside of the romaine, i'm looking forward to eventually harvesting the chard....mmmm! 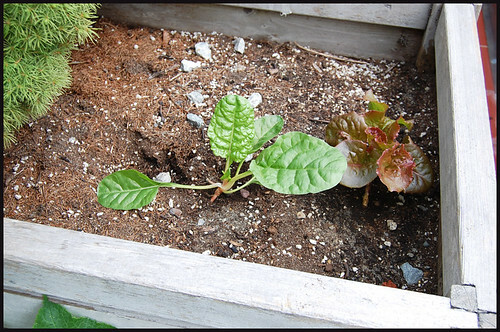 in the existing container boxes, i planted green beans (right side), and sugar snap peas and lettuce (on the left). i harvested the lettuce yesterday (planning on eating it tonight! 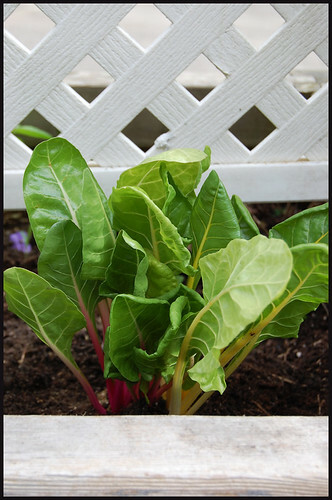 ), and replaced it with a bit of rainbow chard this morning. the peas were an experiment; i gather they are more of a spring veggie, and i wasn't sure if they would even work now that summer's coming on. but lo and behold, they blossomed this past week and when i peeked at them today, i saw a pod!! i am wondering if this is because we've had fairly mild temps lately, in the 60s and 70s? perhaps the pea is being tricked into doing it's thing by the weather? 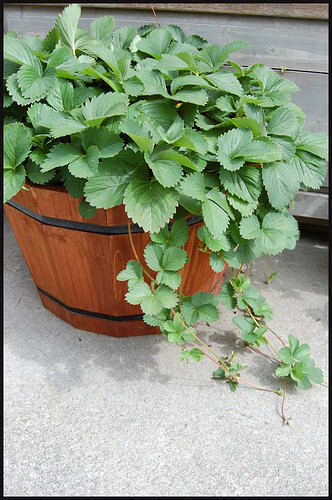 as i mentioned, one of the first things we planted was strawberries...we've already seen one harvest come and go. they were tiny and sweet. the second one is coming on right now...just in the earliest stages of flowering and developing fruit. a leftover lettuce and leftover chard that wouldn't fit in the lettuce/chard container; we popped them in the empty end of the box on the right and if they work out, great! if not, no biggie. these cukes are also an experiment. they are the bush pickle variety, so they are not supposed to go nuts and vine like some other types, but we'll see. hopefully i don't have too many in one container! at any rate, they are looking pretty happy, i noticed some pretty yellow blossoms blooming on them today, so i'm guessing fruit isn't too far behind. 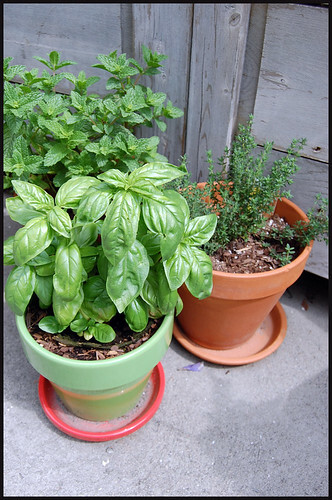 again, like i said, in addition to the strawberries, a bunch of different kinds of herbs were the first things i planted...basil, rosemary, parsley (curly, flatleaf), oregano, mint, thyme. good for so many things...i've been adding cuttings to everything. i've been drying some for storing in the cupboard, and i'm also planning on making some herb-infused oils and vinegars in the very near future. and last but not least...the tomatoes! i got some small, bush-type tomatoes, called "totem". they don't really need much pruning if at all and i am fairly certain they don't need stakes, but i had a few laying around so i thought i'd give 'em some support anyway just in case. they have been doing fairly well...i noticed today that one of them, one of the oldest ones, is turning red!! so exciting! do you garden? 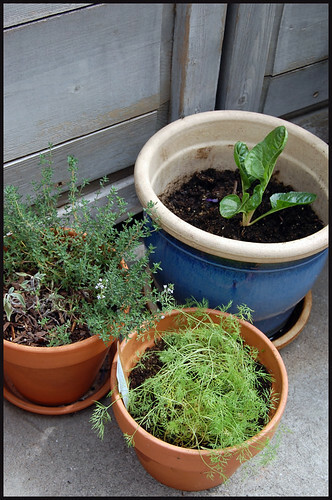 are you growing anything this year? if so, what?? tell me about it!